Who says delicious has to be stressful? 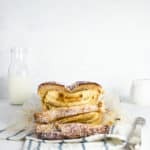 This easy, overnight eggnog french toast sure isn’t! Just 15 minutes of prep in the evening and you’re on your way to the most delicious, I-can’t-believe-it’s-this-easy eggnog french toast. Serving a crowd? Just double this recipe for a 9″x13″ casserole size dish. The nights are getting longer, the days are getting colder and the stores are filled with Christmas carols and eggnog… The holiday season has officially arrived! And with it the obligatory family gatherings, hours of slaving in the kitchen and more dishes than your dishwasher can handle. Don’t get me wrong, I love this time of year. But I don’t love having to prepare show stopping meal after show stopping meal for a crowd. When’s a girl allowed to kick her feet up and enjoy the season? Um, when said girl makes overnight eggnog french toast. This dish requires just 15 minutes of prep. That’s right FIFTEEN. MINUTES. Refrigerate overnight, pop it in the oven the next morning, and let everyone marvel at how easy you make breakfast look. First, cut up your bread and arrange it in your skillet. Whisk together your eggnog, eggs and cinnamon, pour over your bread and toss to coat. Cover and refrigerate overnight. Second, make your steusel by stirring together the flour, brown sugar and cinnamon. Cut in the butter. You can make this the night before and refrigerate it alongside the french toast. 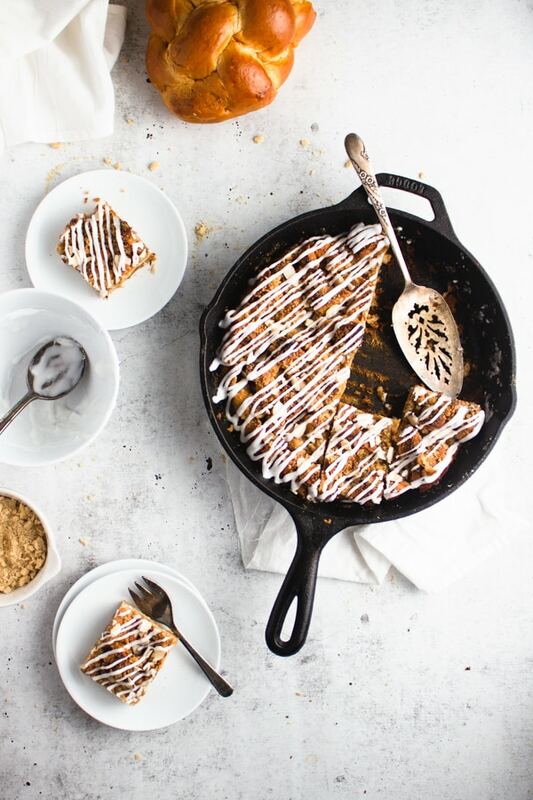 Third, take the skillet out of the refrigerator, sprinkle with the streusel and almonds and bake! Finally, drizzle with an eggnog glaze and serve warm. Serving a crowd: If a 10″ skillet isn’t enough, you can double this recipe and make it in a 9″x13″ casserole dish. Choosing your bread: When choosing your bread, you want a bread that’s sturdy (since it’s going to be soaking overnight) and that you can buy by the loaf. Challah is my favorite, but you can also use brioche. Dairy free: If you need a dairy free version of this dish, you can easily swap out the eggnog for an almond milk eggnog. The measurements will be the same. Shelf life: This french toast bake will keep for approximately 3 days in the refrigerator or 3 months in the freezer. Make sure it’s covered with plastic wrap or aluminum foil to keep it from drying out. You’re just 15 minutes of prep away from the most delicious, I-can’t-believe-it’s-this-easy eggnog french toast. Serving a crowd? 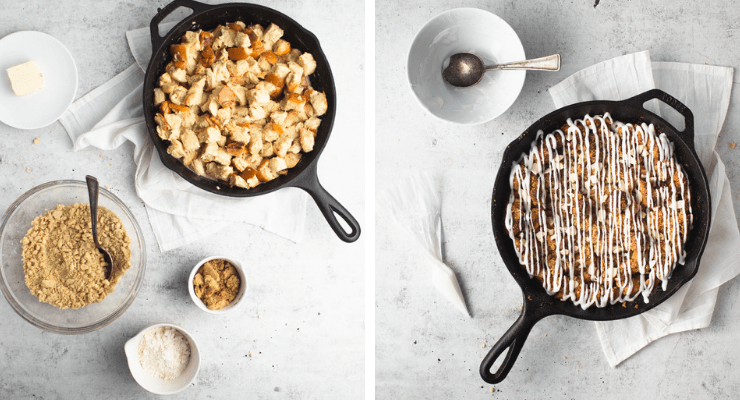 Just double this recipe for a 9″x13″ casserole size breakfast. 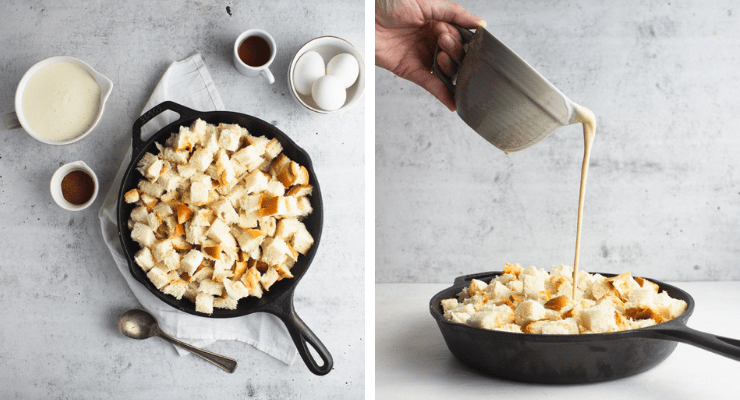 Cut your bread into 1″ thick cubes and arrange in a 10″ skillet. In a bowl, whisk together the eggnog, eggs, brandy (optional) and cinnamon. Pour over top of the bread and toss until completely coated. Cover the skillet with plastic wrap and refrigerate overnight, or for at least 4 hours. To make the steusel topping, combine the flour, brown sugar and cinnamon in a bowl. Cut in the butter using a pastry blender or a fork. Can be made the night before and refrigerated. 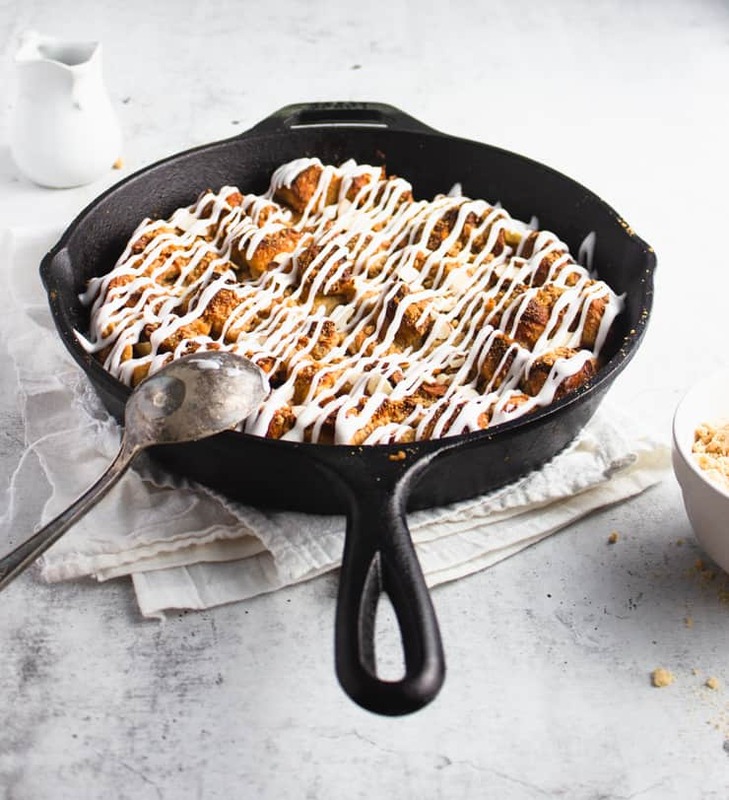 Remove the skillet from the refrigerator, sprinkle with the streusel and chopped almonds and bake at 350F for 45-50 minutes, or until no longer soggy. In a small bowl, whisk together the powdered sugar and eggnog. Drizzle over the french toast and serve, preferably warm. Serving a crowd: If a 10″ skillet that makes 10 slices isn’t enough, you can double this recipe and make it in a 9″x13″ casserole dish. Oh wow! I think I can smell it here. 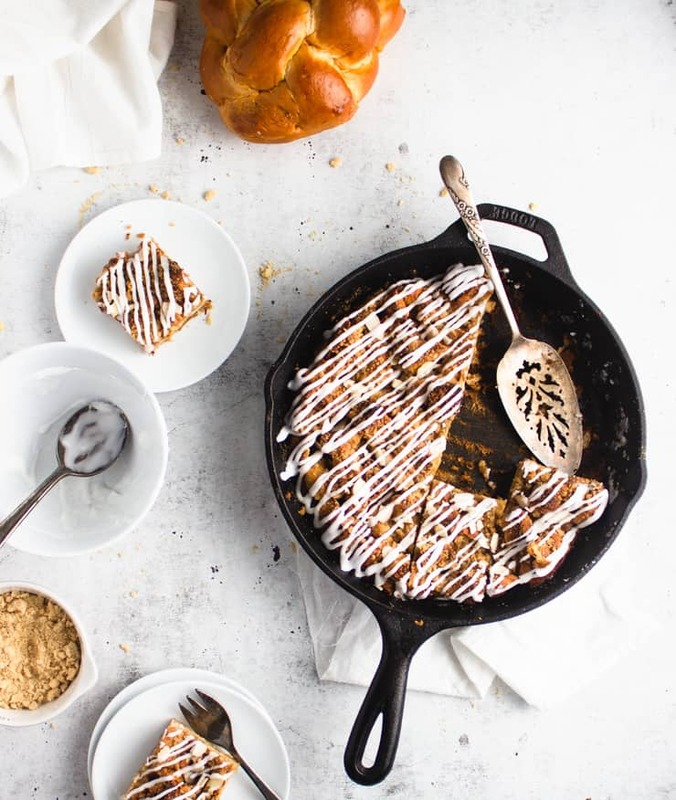 This overnight eggnog french toast looks amazing. This sounds absolutely excellent! Thank you for sharing. I will have to save this for Christmas morning. This sounds AMAZING!!! I love eggnog during the holidays and this is such a great weekend morning breakfast idea!! Yup…this is perfect for all the brunch dates during the holidays. What a great breakfast for Christmas morning. You have to get all the eggnog recipes while eggnog season is here. That must smell heavenly!! I love eggnog and the thought of eating an overnight French toast with eggnog in it makes my heart pitter pat!! I know what hubby and I will be eating on Christmas morn! French toast! My favorite thing to make for family breakfast. 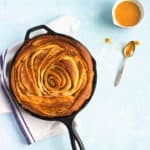 This one looks particularly divine with the use of challah, an egg-cellent bread 🙂 Cannot wait to try. Christmas morning delightful meal! Eggnog flavored breakfast is something that i would make for my whole family! 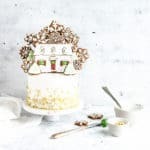 Wow, this sounds so decadent and amazing, a perfect treat for Christmas morning IMHO. The hubby and the darling daughter are really going to love this. I think I’ll make it a surprise. What a fantastic recipe! Love the brandy in this one! My hubby is going to love this and it’s perfect for the holidays! Your step-by-step instructions are SUPER helpful!! What a cute idea for the holidays! Everyone needs a little extra time back in the mornings when you’ve got company. 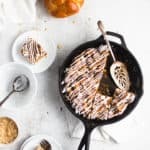 Overnight french toast casseroles are one of my favorite things to make when we have company. I love this seasonal take — so perfect for holiday guests! My daughter loves french toast AND egg nog! I would have never thought to put them together! Her birthday is Wednesday (Sweet 16) and this is what she is going to wake up too! Gosh, I can imagine waking up for a delicious breakfast like this, all the flavours and deliciousness in there. Wow this sounds so good. Flavorful and decadent. I can’t wait to give this a try on Christmas mornings. We all love french toast. This will be a big surprise for my family.